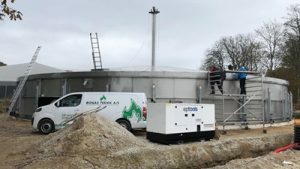 The biogas plant in Hammel near Aarhus can now consider its latest tank as the biggest glycerin tank in Denmark. 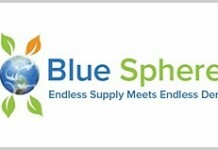 It contains 4.500m³ glycerin in a fully insulated digester made from long-lasting stainless steel. 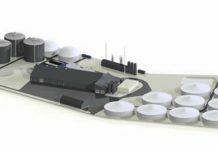 The project is part of an existing biogas plant with a power of two Megawatt. 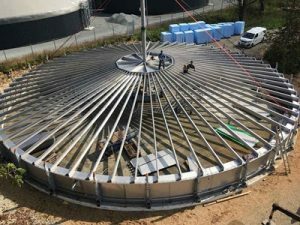 The diameter of the new biogas tank is 25m with a height of almost 9m. 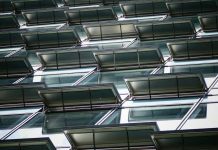 It is constructed with stainless steel shell plates in a segment-like design. At the height of almost 9m, seven rings of the shell plates are necessary. The lower five rings are made from stainless steel 1.4462 and the upper two rings from stainless steel 1.4571 to prevent from corrosion. The digester is covered with a stainless steel roof pillared by a central support. Being composed of an inner and outer screwed element, the outer ring is attached to the top of the tank, whereas, the inner ring is posed higher. Thus, a decline of 10° occurs. The roof is designed for insulation and cladding. It is completed by two inspection openings. Equipped with a heating system and full insulation it has the basic accessories of a digester. Moreover, the biggest glycerin tank in Denmark has two gas-tight wall bushings, two working platforms with ladders and three powerful submersible motor agitators in stainless steel. The basis for the fermentation process is glycerin with a pH value between 3,5 and 8. It is a waste from the production of biodiesel. Having a density of 1,3 kg/l, the glycerin is heated up to 52°. Glycerin is considered to be the most valuable input for the fermentation process because the bacteria transform almost all of the glycerin. Thus, there are almost no fermentation residues. A comparison between the output of corn and glycerin illustrate the energetic value of glycerin. General guidance levels say that one ton of corn yields to 200-250 m³ gas, whereas, glycerin yields to 1.000 m³ gas. The most crucial part of the project was the construction phase due to the enormous size of the tank. After the assembly of the first ring including the roof, the whole digester was electrically lifted up. 37 pillars were used to lift up the first ring and another four we needed to lift up the central support as well. Then the second ring was assembled and the tank was lifted several times until the seventh ring was constructed. It was a simple decision explains the plant owner. We have decided for stainless steel because it is the most durable material in terms of corrosion. And the decision for Stallkamp was easy as well. With the experienced and reliable distribution partner Biogas Teknik A/S, we knew that this project would going to be a success.